May is Asian-Pacific American Heritage Month, which means it’s the perfect time to honor and celebrate Asian and Pacific Islanders within the United States! May is Asian-Pacific American Heritage Month, which means it’s the perfect time to honor and celebrate students who are also Asian and Pacific Islanders within the United States! Throughout the month, the nation hosts a celebration of Asians and Pacific Islanders in the United States. Why May? According to the government's Asian-Pacific American Heritage Month site, "the month of May was chosen to commemorate the immigration of the first Japanese to the United States on May 7, 1843, and to mark the anniversary of the completion of the transcontinental railroad on May 10, 1869. The majority of the workers who laid the tracks were Chinese immigrants." What began as a week-long celebration in the 1970s, the honor was extended to a month under President George H.W. Bush. May became the official designation of Asian-Pacific American Heritage Month after President Bush signed it into law in 1992. 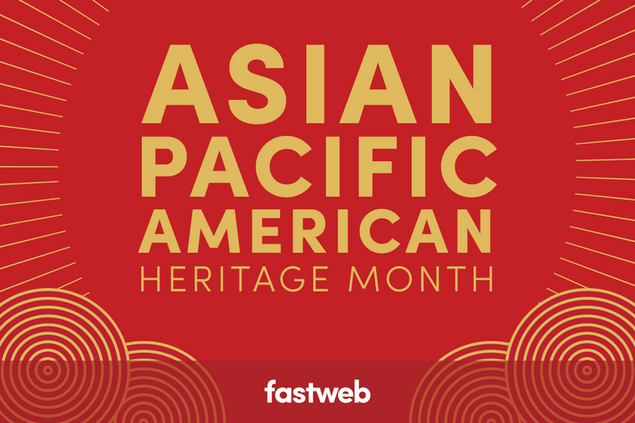 In honor of Asian-Pacific American Heritage Month, Fastweb is celebrating students with Asian-Pacific heritage with the following list of scholarships, all of which celebrate the value of a student’s diverse background. To help better organize your scholarship and internship search, please note that the following scholarships for Asian Pacific American students are listed according to deadline, with the earliest deadline appearing at the top of the page. Deadlines that vary will appear at the bottom of each list. The Against the Grain Artistic Scholarship is available to high school seniors and full - time college students of Asian and / or Pacific Islander ethnicity. You must be pursuing a major in the performing / visual arts, journalism, and / or mass communications and have a minimum 3.0 GPA to be eligible for this award. You must also demonstrate leadership abilities through participation in community service, extracurricular, or other activities. Get more information on the Against the Grain Artistic Scholarship. The Hsiao Memorial Social Sciences Scholarship is available to students of Asian heritage. You must have a minimum GPA of 3.0 to be eligible for this award. Preference is given to students pursuing a degree in economics. Get more information on the Hsiao Memorial Social Sciences Scholarship. The Asian American Architects and Engineers Association Scholarship is available to full - time students in good academic standing and currently enrolled in one of the following majors: architecture, engineering, landscape architecture, planning and urban design or construction / construction management. You must also be a student member of AAa/e. Recent graduates from the spring or summer term before the application date are also eligible. You must also be a U.S. permanent resident or U.S. citizen and demonstrate involvement in and / or service to the Asian / Pacific Islander community. Get more information on the Asian American Architects and Engineers Association Scholarship. The Bill Caspare Memorial Fund Diversity Scholarship is available to full - time junior, senior, and graduate students who are African - American, Asian American, Hispanic American, Native American, multiracial, or part of the LGBTQ community. You must be interested in new media / digital advertising / data science, and have a minimum 3.25 GPA to be eligible for this award. Get more information on the Bill Caspare Memorial Fund Diversity Scholarship. The Asian Heritage Law School Scholarship is available to students enrolled at an accredited law school. You must be of Asian heritage with at least one parent of Asian ancestry and have a minimum 3.0 undergraduate GPA to qualify for this award. A one to three page essay is also required. Get more information on the Asian Heritage Law School Scholarship. The Organization of Chinese-Americans Asian Student Scholarship is available to continuing students attending Westchester Community College. You must be of Asian decent, have completed at least 12 credits with a minimum GPA of 3.0. You must also be enrolled for a minimum of six credits during the term of the award to be eligible for this scholarship. In addition, recipients are encouraged to assist other students as a math tutor. Get more information on the Organization of Chinese-Americans Asian Student Scholarship. The F. Armstrong Scholarship is open to entering freshmen at Cornell College who contribute to campus diversity. Get more information on the F. Armstrong Scholarship – Cornell College. The Diversity Scholarship is available to entering students at the Adler School of Professional Psychology. You must demonstrate a commitment to diversity as it relates to your interest in psychology in order to qualify for this award. Priority is given to applicants who belong to ethnic, racial, religious, cultural, and sexual identity groups that have traditionally been underrepresented populations in the field of psychology. Get more information on the Diversity Scholarship. The Vaughn Scholarship for Students of Color is available to African - American, Asian American, Hispanic, and Native American students at Nebraska Wesleyan University. You must demonstrate financial need to be eligible for this award. Get more information on the Vaughn Scholarship for Students of Color. The YMCA of Greater Rochester Enhancement of Diversity Scholarship is open to racial/ethnic minority students who have a strong interest in YMCA involvement. You must be a full- or part-time matriculated student at an accredited college or university with a minimum of one semester completed. You must also intern at least half-time (16-20 hours per week) at the YMCA during the school year and full-time during the summer, and have an interest in post-graduate career opportunities with the YMCA to qualify for this award. Get more information on the YMCA of Greater Rochester Enhancement of Diversity Scholarship. The DiversityAbroad.com Study Abroad Blogging Scholarship is available to minority undergraduate students who have been accepted to participate in a study abroad, intern abroad, language immersion abroad, or volunteer abroad program offered through a DiversityAbroad.com partner organization. You must have a minimum 2.75 GPA at an American college or university to be eligible for this award. Get more information on the DiversityAbroad.com Study Abroad Blogging Scholarship. The Asian Pacific American Association ASPIRE Program Scholarship is available to students at Evergreen Valley College. You must have completed at least nine units with a minimum GPA of 2.0 and be a current ASPIRE student to qualify for this award. Get more information on the Asian Pacific American Association ASPIRE Program Scholarship. The Wildermuth Asian - Technology Endowed Scholarship is available to full - time students at Graceland University. You must be a citizen of an Asian / Pacific Rim country and have declared a CSIT major to be eligible for this award. Get more information on the Wildermuth Asian - Technology Endowed Scholarship. The Asian Pacific Islander American Staff Association Scholarship is open to Asian Pacific Islander students who have completed at least 12 units at San Joaquin Delta College and have a minimum 3.5 GPA. You must submit a one-page statement reflecting your personal character and at least one letter of recommendation from an instructor in your major to be eligible for this award. Get more information on the Asian Pacific Islander American Staff Association Scholarship. The Irving and Ina Markowitz Prize in Asian History is open to students at Hofstra University who have demonstrated outstanding performance in Asian history. Get more information on the Li Ching Fellowship Fund. The Dr. Chee-Mok Chan Scholarship is open to students at California State University - Bakersfield. You must have a minimum 3.0 GPA and demonstrate financial need and evidence of campus and community involvement to be considered for this award. Students of Chinese/Asian descent are especially encouraged to apply. Get more information on the Dr. Chee-Mok Chan Scholarship. The Kiran and Pallavi Patel Scholarship in Medicine is available to students at the University of South Florida College of Medicine. You must demonstrate financial need to be eligible for this award. Preference is given to South Asian students. Get more information on the Kiran and Pallavi Patel Scholarship in Medicine. The Diversity Out-of-State Tuition Waiver is open to students from diverse ethnic backgrounds attending the University of Idaho. You must not be a resident of Idaho and have a minimum 2.0 GPA to be eligible for this award. Get more information on the Diversity Out-of-State Tuition Waiver – University of Idaho. The Richard and Barbara Reeves-Ellington Scholarship is open to students pursuing bachelors degrees at Excelsior College. This scholarship is awarded based on an essay focusing on ways you plan to pursue leadership roles that address gender issues and issues central to Middle Eastern and Central Asian Culture. Your essay should not to exceed one page. Get more information on the Richard and Barbara Reeves-Ellington Scholarship. Provided by the Asian and Pacific Islander Wellness Center, the Queer Asian & Pacific Islander Pride Scholarship is open to Asian and Pacific Islander lesbian, gay, bisexual, transgender, queer, or questioning students. You must be 22 years old or younger and living in the San Francisco Bay Area to be eligible for this award. Learn more information about the Queer Asian & Pacific Islander Pride Scholarship. The Diversity Scholars Scholarship is open to full-time undergraduate and graduate students from diverse ethnic backgrounds attending the University of Idaho. Get more information on the Diversity Scholars Scholarship – University of Idaho. The Dr. Kwan-Wai So Memorial Scholarship Fund in History is available to graduate students enrolled in the Michigan State University, College of Social Science. You must be majoring in history to be eligible for this award. Extra consideration shall be given to applicants who have a focus or concentration in Asian History. Get more information on the Dr. Kwan-Wai So Memorial Scholarship Fund in History. The Niermeyer Foundation Scholarship is open to African-American and Asian-American students at the State University of New York, Binghamton. You must be in good academic standing and demonstrate financial need to be considered for this award. Get more information on the Niermeyer Foundation Scholarship. The Quezon Fellowship is open to international students at The Fletcher School at Tufts University. You must be from the Philippines or other ASEAN countries, or to other Fletcher students from other world regions who are interested in studying the East Asian and Pacific region to qualify for this award. Get more information on the Quezon Fellowship. The Rashad G. Richardson "I Can Achieve" Memorial Scholarship is open to African American, Latino, Asian and Native American students at Ithaca College. To be eligible, you must be a sophomore, junior or senior, have a minimum 3.0 GPA, be in good academic and judicial standing, and demonstrate high achievement and contributions toward improving the quality of life for African American, Asian, Latino and Native American youth in Tompkins County. Get more information on the Rashad G. Richardson "I Can Achieve" Memorial Scholarship. The Leeward CC Pacific Islander Grant is open to students at Leeward Community College. You must be a citizen of an eligible Pacific Island, have a minimum 2.0 GPA and be enrolled in at least six credits. You must also file a FAFSA and demonstrate financial need to be eligible for this award. Award is for first degree students only. Get more information on the Leeward CC Pacific Islander Grant. The National Pacific Islander Educators Network (NPIEN) Scholarship is available to students at Evergreen Valley College. You must have completed at least 12 units with a minimum GPA of 2.8 and demonstrate financial need to qualify for this award. Get more information on the National Pacific Islander Educators Network (NPIEN) Scholarship. The Kiran and Pallavi Patel Scholarship in Medicine is available to students at the University of South Florida College of Medicine. You must demonstrate financial need to be eligible for this award. Preference is given to South Asian students. Get more information on the Kiran and Pallavi Patel Scholarship in Medicine . The Charles and Margaret Halsey Scholarship is open to students attending Princeton University. Get more information on the Charles and Margaret Halsey Scholarship. The Trustee Diversity Scholarship is available to admitted freshmen at Rice University. You must demonstrate diverse life experiences and contributions to diverse groups to qualify for this award. Get more information on the Trustee Diversity Scholarship – Rice University. The William Randolph Hearst Foundation Endowed Scholarship is available to full - time, minority undergraduate students at Savannah College of Art and Design. To be eligible, you must have a minimum 3.0 GPA and have completed at least 45 credit hours. Both domestic and international students may apply; however, the recipient must permanently reside in the United States after the completion of his or her studies. Get more information on the William Randolph Hearst Foundation Endowed Scholarship. The Diversity Advancement Program Scholarship is open to graduate students at Rutgers University, Edward J. Bloustein School of Planning and Public Policy who are from underrepresented populations. Get more information on the Diversity Advancement Program Scholarship. The Arrupe Scholarship is available to entering freshmen at the University of Scranton. You must be a minority student to be eligible for this award. Get more information on the Arrupe Scholarship. The George Washington Carver Scholarship is open to entering freshmen and transfer students at Simpson College who have distinctive and broadly diverse backgrounds. Get more information on the Arrupe Scholarship.